Saina won her second career Super Series title by winning the Singapore Open title on June 20, 2010. 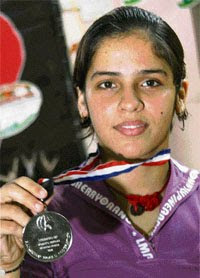 She completed a hat-trick in the same year by winning the Indonesian Open on June 27, 2010. This win resulted in her rise to 3rd ranking. Tnow the saina is just step away from reaching the summit of womens badminton, having risen to world number 2 in the latest ranking. saina now has 64791.2637 points and is just behind chinese yi han wang.another chinese xin wang is in 3rd place.. Previously coached by S. M. Arif, a Dronacharya Award winner, Saina is the reigning Indian national junior champion and is currently coached by Indonesian badminton legend Atik Jauhari since August 2008, with the former All England champion and national coach Pullela Gopichand being her mentor. Her professional career is managed by GloboSport. Saina was born in Hisar, Haryana and has spent her entire life in city of Hyderabad, India. Her foray into the world of badminton was influenced by her father Dr. Harvir Singh, a scientist at the Directorate of Oilseeds Research, Hyderabad and her mother Usha Nehwal, both of whom were former badminton champions in Haryana.And She is top ranker in Indian Badminton history. saina नेहवाल भारत की पहली ऐसी महिला हैं जो बद्मिन्तों के इतिहास में भारत की तरफ से पुरे विश्व में तीसरे पायदान तक पहुँच पायीं. और वह यह भी मानती हैं की वे सिखर तक यानी की पहले पायदान तक पहुँचने की छमता तख्ती हैं. badminton champion saina nehwal biography saina climbs to world no.2 saina nehwal biography saina nehwal is the ultimate champ of india. Labels: badminton champion saina nehwal biography saina climbs to world no.2 saina nehwal biography saina nehwal is the ultimate champ of india.